Through nearly 1,900 blog posts, we've discussed a lot of topics. Few topics have generated the interest that the topic of age generated over the past three weeks, both positive, and negative. Question: Obviously, you work with a set of brands that are not representative of all catalogers, correct? Maybe so, maybe not. Catalogers with a retail presence have a different set of dynamics, as different demographic profiles enter stores. I'm confident, based on what so many of you have told me, that this is a problem for somewhere between 65% and 85% of catalog brands. Question: You can fix this problem with social media and a strong mobile or tablet presence, correct? Just modernize! Oh boy. Sometimes, we just don't think about what we're recommending. Something like 5% of the population owns a tablet. Only 1 in 3 Americans own a smartphone. And the folks who own tables or smartphones are not currently in the catalog "wheelhouse", if you will. In other words, it isn't easy for a catalog brand to attract a scalable audience of 33 year old tablet-toting social media experts. Conversely, a 59 year old catalog shopper over the telephone isn't likely to squint through the process of ordering via a 2" smartphone screen. In other words, I don't think catalog brands fix this problem with social media and a strong mobile or tablet presence. That doesn't mean the cataloger doesn't try things, it just means that there is an "audience disconnect" that cannot be easily resolved. Question: I know of a company that has a 32 year old customer, and they have a vibrant catalog business. So is it possible, Kevin, that you're dealing with a biased sample? Now, is it also possible that there are seven catalogers with 55-65 year old customers for every one cataloger with a 32 year old customer? We all suffer from sample bias. We see what we want to see. I am confident that there are more catalogers with the 55-65 year old customer problem than there are catalogers with a 32 year old customer base. Question: Kevin, this isn't a problem. It's simply the audience that is attracted to a catalog brand. Why not go out and acquire as many 55-65 year old customers as possible? I think this is a good thing. It can be a good thing. 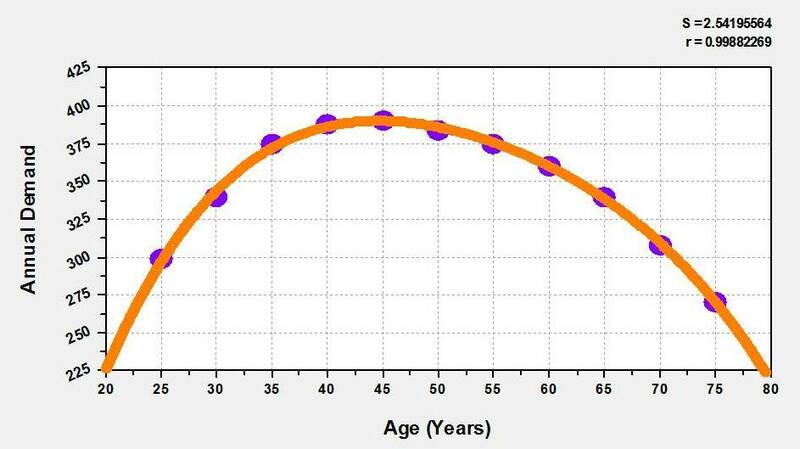 If the average age of your customer has been 59 years old for the past decade, you are about to have the biggest cohort of 59 year-olds move through your sweet spot in history. Start printing money! But if your customer was 49 years old in 1998, and is 59 years old today, then you have a serious problem brewing. Look at the productivity in the second image ... productivity declines with age, as your customer moves into the 60-69 age range, productivity falls off of a cliff. You keep telling me that customer acquisition is getting harder and harder ... that only makes sense if you end up attracting a 55-64 year old audience that spends less than other demographic cohorts, while the 35-54 year old demographic tunes out catalogs, right? Question: You're always talking about B2C. This isn't a problem in B2B, is it? I'll grant you this ... B2B issues are different than B2C issues. I'd rather have a relationship with a 62 year old decision maker in B2B than a 62 year old customer in B2C, no doubt. Question: How do I create a catalog that fixes this problem? In other words, how do I create a catalog that speaks to a 29 year old customer? I would not try new creative that speaks to a 29 year old customer, then send it to a 62 year old customer ... I've witnessed that one too much over the past twenty years to care to mention! I'm not convinced that the majority of us can create a catalog that resonates with a younger customer. Some of us can, you are always quick to point those brands out to me, but by and large, it's hard work folks, it's hard work! Question: Let me restate my question. Should I extend my brand to a younger audience? Your brand and your marketing attract an audience. It is my opinion that if you want to attract a younger audience, you create a brand specifically for a younger audience. It is my opinion that catalogers, through the style of marketing catalogers practice, attract an older audience. This isn't fixed by going younger, you simply alienate the older audience and you struggle to attract the younger audience. Question: Is this my fault, or a simple aging of the population? 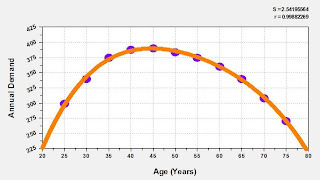 According to the US Census Bureau, the average age of a person in the United States is 35-39 years old. This means that the average age of a consumer is somewhere between 40-49 years old. In many ways, this is our fault. Question: Why is this my fault? By and large, we bought into a concept called "multichannel". This concept sounded seductive, and given the landscape of the world in 2000-2004, it made sense. We were told to keep mailing catalogs to customers, because catalogs caused customers to shop on the internet. In the past five years, the world changed. Today, we have a disconnect, a disconnect that is our fault. Customers age 60+ largely respond to catalogs as they always have. Customers age 50-59 are willing to shop online after receiving a catalog (these customers were 40-49 when we were told we must be "multichannel" ... so that makes sense). Customers age 40-49 tend to go in a lot of different directions ... shopping online after receiving catalogs, or being willing to enter the magical world of social commerce, or using Google as a Shopping Sherpa, or buying after receiving a 20% off plus free shipping promo via e-mail marketing. Customers under age 40 do a lot of different things as well, but the catalog-inspired aspect of shopping drops off significantly as the customer ages. Co-Ops, who in many cases contribute 50% or more of the new names to catalog brands, have unconsciously (or consciously) targeted 55+ rural customers. These customers are the easiest to track, because they shop via keycodes over the telephone. Our dependence on co-ops provides a feedback loop that results in a skew in our customer base to 55+ rural shoppers, who demand creative and merchandise that works among 55+ rural shoppers. We never addressed the "free shipping problem". Younger customers have addressed this problem, they found Amazon and Zappos and Social Commerce brands that offer free shipping. Our way of addressing this was to integrate all channels, charging $14.95 for shipping and handling, alienating a younger audience. Take a look at catalog creative. A professional recently told me that catalog creative looks like something that "old people" would like. Just look at your creative. Which audience do you think your creative will attract? Question: I don't append age data. How do I know if my customer base has aged significantly? If more than 2% of your direct-to-consumer orders come in via the mail, with a check inside the order form, your customer base has aged. If more than 40% of your direct-to-consumer orders are taken over the telephone, your customer base has aged. There are, obviously, exceptions to these guidelines. Question: We're multichannel, so this doesn't impact us, right? The vendor community sold us a bill of goods on this multichannel thing. By tethering our online experience to the catalog, we limited our ability to be relevant to younger customers. By limiting our ability to be relevant to younger customers, we found that older customers responded to our marketing activities. This caused the co-ops to optimize their models around older customers who responded to catalog-tethered online activities. As a result, we acquired older customers at a disproportionately fast rate. As our customer base aged, we calibrated our merchandise and creative to appeal to this older audience. Our merchandise and creative did not appeal to younger customers as much. This feedback loop keeps on self-reinforcing upon itself. Get the picture? This is what multichannel marketing did to us. We just couldn't have known this in 2001 when we went down the multichannel path with vim and vigor. Question: But social media and mobile don't work, so what do we do? Social Media and Mobile are not likely to work among a 55-64 year old customer. So, we have to make a decision. Here's my opinion: We ride the Baby Boomer generation into the sunset with our catalog marketing activities. We craft new brands that resonate with a younger audience, using the profit thrown off by the catalog business to fuel the startup. Or, just milk the profit generated by a 55-64 year old customer, until that audience is no longer productive, there's nothing wrong with that. Honestly, I don't think we solve this problem by trying to calibrate our brands to be attractive to younger customers. We either ride one audience into the future, or we attempt a new brand focused on younger customers. This is simply my opinion. Your mileage will vary. Time for your thoughts. As I mentioned, the two charts at the top of this post have stimulated more conversation than almost any other topic I've written about. How would you address this issue? Do you believe this isn't an issue? Tell us what you think.